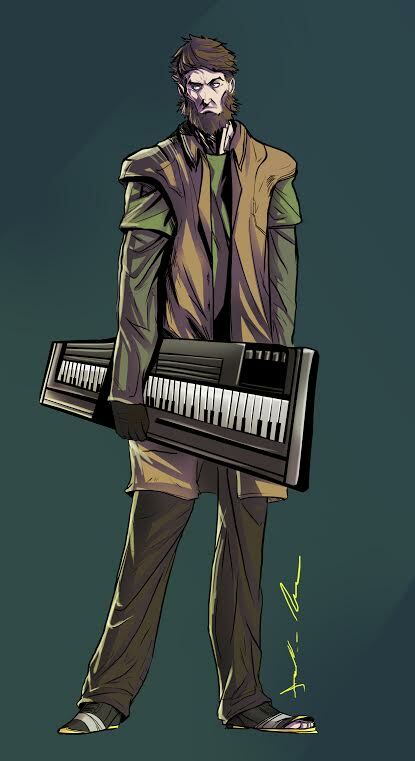 Razor Edge Games would like to introduce you to the second member of the rhythmic Harbingers, “Tall” Norbin. Everyone has a role to play in the AfterFall. Those who don’t make themselves useful don’t last. But not everyone finds their calling scavenging in ruins or fighting off marauders. And that’s good for Tall, because he’s not exactly capable until you put a keyboard under his hands. But when his fingers are on the keys, Tall produces a surprisingly vital resource–music. His adaptive melodies and harmonies provide distraction and hope to the people of the wasteland. To his new family, the Harbingers, he brings lessons learned over his years in the Desert Rats, who know that you can’t judge anyone on how they survive. It’s a mindset that lends itself well to the ever-changing lifestyle of the Harbingers, and adds a unique flavor to the band and to the sounds of the AfterFall.